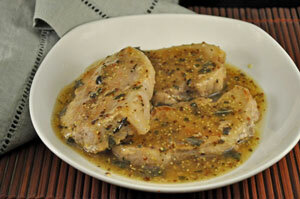 Thyme for Cooking Dinner tonight: Pork Chops with Maple Syrup. I used boneless chops for this, about 1/2" (1.25cm) thick. They cooked quickly, but, remember, slightly pink pork is okay, and keeps it tender and moist. If you don't have maple syrup you can use honey, or even brown sugar. It's a simple, flexible recipe! In medium nonstick skillet heat oil over medium heat. Add pork chops and brown on both sides, about 5 minutes each. Add beef stock, wine, maple syrup, mustard and sage. Cover, reduce heat and simmer 10 minutes. Uncover and remove chops to small platter. Cover to keep warm. Increase heat under skillet. Dissolve cornstarch in water and stir into simmering sauce. Spoon some sauce over chops and serve, remaining sauce on the side. Simple boiled potatoes with a twist: Sautéed in a bit of butter and topped with freshly snipped chives. Scrub potatoes and cut into eighths - we want large but still bite-size pieces. Put into a sauce pan and cover with water to which you add 1/4 tsp salt. Cover and bring to a boil. When boiling move cover so it is ajar else the potatoes will boil over. They will, I promise. Remove from heat when just barely done - a little under done is good(stick a knife in and test - should go in easily), about 15 minutes. Drain. In medium nonstick skillet melt butter over medium heat. When hot add potatoes. 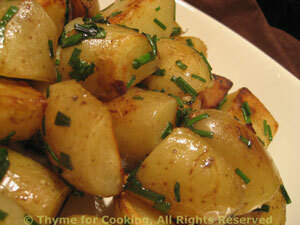 When potatoes are just starting to get a golden color (on one or more sides - about 10 minutes) add chives. Turn heat to low and continue to sauté another 10 minutes. Remove, add salt and pepper if using and serve. 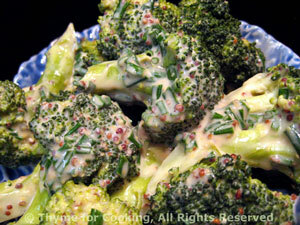 Crisp tender broccoli with a creamy, slightly hot mustard sauce is a nice accompaniment to any meal. Put in steamer basket in saucepan with an inch of water in bottom. Put on medium heat and steam for 10 minutes or until just done but still green. In same pan gently heat yogurt, mustard and chives. Add broccoli and stir, heating through. Serve.